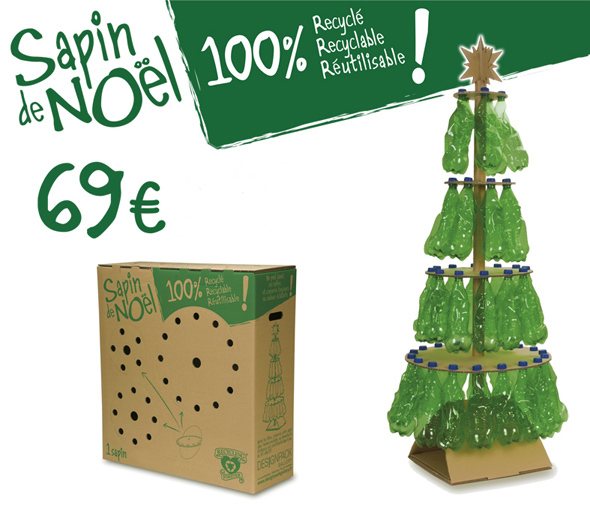 A Recycled Christmas Tree Made of Bottles | TonerGreen - Eco-Friendly Toners from the U.S. Remember when you were a kid, about how excited you are to open your gift under that Christmas tree. Yes, Christmas trees became a symbolic piece that signals the forthcoming of the happy holidays. And though, we've be used to the real trees we decorate every December perhaps this year you would want to make a change! How? Then use a recycled Christmas tree for your holiday decoration. While surfing the web, I happened to stumble upon this Christmas tree made from of green recycled bottles which you could find in the streets of Paris. This recycled Christmas trees were originally done for the promotion of the DesignPack Gallery to encourage people in using eco-friendly furniture made from recyclable materials (specifically green plastic bottles). According to Gizmodo, "The message is to collect bottles and re-use them in unique ways, like making Christmas trees." The original design was done by Fabrice Peltier, Founder of the DesignPack Gallery. He described the recycled Christmas tree or Sapin de Noel as "a singular tree, ecological and fun." Its packaged box contained 3 plastic bottles recovered, mast foot and also has 100% recycled cardboard as the medium that is used to mount the tree. "I dreamed for years of a place dedicated to packaging design," told Fabrice Peltier about his thoughts that led him to build the DesignPack Gallery. "That's what I've done here with Designpack Alley Gallery and Recycling." It's amazing how people came up with different ideas to implement recycling and now during the happy holidays, we couldn't be more surprise to note of these recyclable Christmas decorations that are sure a wonderful sight to catch in your house. However, if you want to save on your holiday printing expenses on the other hand, you can use remanufactured toner cartridges and ink cartridges instead. Just a helpful and eco-friendly tip this Christmas.